The 237 measures leaf wetness by determining the electrical resistance on the surface of the sensor. (A wet surface is less resistant.) It is primarily used to determine the percentage of time that a leaf surface is wet, versus the time it is dry. Note: The 237 is designed for short duration ac excitation. The sensing grid may become damaged by dc excitation or continuous ac excitation. The 237 consists of a circuit board with interlacing gold-plated fingers. Condensation on the sensor lowers the resistance between the fingers, which is measured by the data logger. Droplets must touch two fingers simultaneously to change the sensor resistance. For this reason, the 237 is typically coated with flat latex paint, which spreads water droplets. The color and type of paint affect sensor performance. Campbell Scientific supplies the sensor unpainted, allowing customers to determine the appropriate paint to apply to the sensor's surface. The appropriate pigmentation should closely emulate the properties of a typical leaf. For more information on the effects of paint color and sensor angle on sensors of this type, see Gillespie, T.J., & Kidd, G.E., 1978. Sensing duration of leaf moisture resistance using electrical impedance grids. Canadian Journal of Plant Science 58: 179-187. The resistance of the sensor at the wet/dry transition point should be determined. A sharp change in resistance occurs in the wet-dry transition on the uncoated sensor; normally the transition is between 50 and 200 kohm. Coated sensors have a poorly defined transition, which normally occurs from 20 kohm to above 1,000 kohm. For best results, the leaf wetness sensor should be field calibrated because the transition point will vary for different areas and vegetation. Sensor may crack when temperature drops below -40°C. The 237 requires one single-ended analog input and one switched excitation channel for measurement. What is the distance between the two electrodes in the 237-L? What are the power requirements of the 237-L? Variable, but always negligible. The theoretical maximum for each measurement is 5000 mV at 5 µA for less than 3 ms.
Is there a difference in the wetness duration between the 237-L and the leaf because of the difference in thermal conductivity? Yes. The thermal characteristics of the 237-L are probably different from those of any surrounding objects, including leaves. Consequently, the 237-L will dry at a rate different from surrounding objects, including leaves. What type of paint should be used on the surface of the 237-L? Paint only with a flat latex paint. Usually, a high-quality, white, flat latex paint is used with a tiny amount of pigment. Can the 237-L be used as a conductivity sensor? 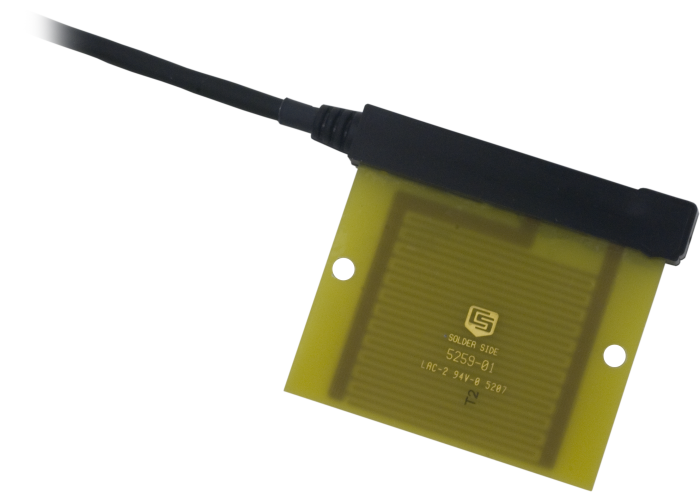 The 237-L is not designed to be used as a conductivity sensor. To our knowledge, a few people have tried this but have been unsuccessful. Can the 237-L generate a specific moisture content? No. The sensor signal can only be interpreted as either wet or dry. How should the 237-L be mounted? The mounting method used depends on the application. In plant canopies, consider mounting the 237-L so that it receives the least amount of solar radiation at noon. This means tipping the sensor, electrodes up, so that its sensing surface is parallel to the plane of the ecliptic. Tipping the sensor also minimizes the chance of water puddling on its surface. On non-living surfaces, such as a man-made structure, consider mounting the 237-L flat against a flat surface on the shady side. This will cause the 237-L’s thermal characteristics to be more similar to those of the surface being studied. Is the 237-L really a sensor? Only in the most basic sense. The signal output from the 237-L can only be interpreted as an indication of the presence of a conductive material bridging the two electrodes on its surface. If the circuit is open (infinite resistance or zero conductance), there is no conductive material. If the circuit is closed, there is conductive material. Each 237-L is prepared and maintained in the same way. Each 237-L is mounted in nearly identical environments. Plant disease researchers found that if a 237-L sensor was placed in a plant canopy at a consistent position, with a consistent coating of a spreading material on its surface (that is, paint), they could estimate when free water was in the plant canopy. From this discovery, they were able to formulate disease emergence models. The resulting models tolerate significant deviation in moisture-presence data. Even so, use of a different spreading material, or difference in sensor positioning, may invalidate the data. Can a leaf wetness sensor be added to an ET107? What is the difference between the LWS-L and the 237-L leaf wetness sensors? Both leaf wetness sensors are compatible with all Campbell Scientific data loggers. However, the 237-L is often used in large legacy networks that rely on the 237-L for data continuity. The 237-L does require painting and field calibration, whereas the LWS-L does not.